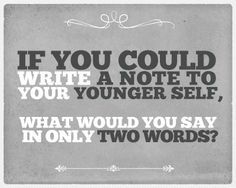 This is only a quick post… but I saw this image on Facebook today, and I wondered what on earth I would say to my younger self. After thinking about it for a long time, I think that there is actually a number of things I would like to say to my younger self… some of them longer than two words, but all of them relevant. So on that note – what would you guys say to your younger self if you have the chance to travel back in time? And would you have listened? Me? Probably not, as I’m pretty darn stubborn. I think mine would simply be – you are not Satan’s child, and all the bad stuff doesn’t happen because of you, so stop feeling responsible for it all. Those are VERY wise words to oneself.